The Trump administration doesn’t want to see hemp expanded nationwide in the next Farm Bill because of concerns about overproduction, an official said Wednesday. Greg Ibach, undersecretary for the U.S. Department of Agriculture, said current hemp regulations are “fairly narrow” and that the Trump administration doesn’t necessarily want to see that change when the Farm Bill is rewritten this year. The 2014 Farm Bill allowed hemp production for the first time in a generation – but only in states with authorized hemp research projects. “Opening the door wide open nationwide, with no restrictions, may not be in the best interests of the hemp industry,” Ibach said, providing the most thorough comments yet from the Trump administration about hemp. “One of the challenges we maybe have in the hemp industry is to make sure that demand and production coincide,” he told the media, including Marijuana Business Daily, after speaking at the Governor’s Forum on Colorado Agriculture in Denver. Asked how the USDA and Trump administration envision hemp being regulated, Ibach said there’s danger to opening up the market to all states. “We need to be careful so that we don’t kill the market for hemp by overburdening the market with supply before there is demand for it,” Ibach added. He said oversight of hemp should belong to the U.S. Department of Justice, which includes the Drug Enforcement Administration, not the USDA. The DEA appeared in court last week to argue that CBD, a molecule derived from hemp and marijuana, is an illegal drug and not authorized by the Farm Bill. Sad and ill informed. Since when is the USDA not for farmers? Do farmers need protection or should we just let the free market decide? US growers are already self-regulating production to match up to global over supply (food / grain markets) we don’t need help figuring that out. Very disappointed in our USDA leadership…hard to have innovation with this type thinking. Free market for farmers–you mean like Subsidies? I think it be YOU who is not well informed. But then again–your no farmer……. Just figured I’d inform you, and anyone else who reads your post, that you’re ignorant, and probably shouldn’t be listened to. This is cover for the industries hemp threatens when legal. Textiles like paper and cloth, food, OIL, tobacco, construction materials and MEDICINE. That is a lot of lobbying power against a simple plant. Definitely correct on that Charlie Brown. That is the main reason why all this fuse is over these plants. It all comes down to the money. Preston, I totally agree with. Over production is a very real problem. Farmers not being able to find markets for their harvests, and not being able to recoup investment will hinder the growth of this industry. Every agricultural commodity market today had assistance from the Federal Government, whether it be in the form of price supports, research grants that lead to markets (NIFA is playing ball), subsidies, value added producer loans, import tariffs, export assistance, etc. No agricultural commodity has faced this level of risk conjured by government overreach, the of result of this is that capital in the industry usually comes by way of expensive financing, predatory lenders, and opportunistic investors. To that end, the DOJ has NO place in regulating or overseeing the rule-making or governance of an agricultural commodity. If the DOJ continues to be the agency responsible for overseeing hemp the industry will continue wobbling through what should be a robust period of growth serving rural communities that voted this administration into office. 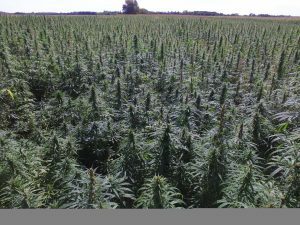 If the Trump Admin and Ibach truly care to solve the problem of supply/demand imbalance they would support efforts to amend the farm bill to have the hemp program overseen by the USDA. Oh please. Just get over it set the rule for taxing it and the regulations on growing, selling and product production. I am a Trump supporter all the way. However I am also a woman with several chronic conditions several of which cause me unending pain. If it was legalized on a federal level I might stand a chance of getting it for pain. Because I refuse out right to take pain pills. I have been refusing for years and that isn’t going to change not only are they addicting but the side effects would only worsen my state. I have no quality of life anymore. I have only left my home three time in three months. Because of pain and my auto-immune conditions. IC is just the beginning of the suffering. Once you have IC there arebmore conditions to come. Not to mention the allergies that develop. Stop spouting info from forty years ago and do the right thing. Shouldn’t have voted Trump then. Voted against your own interests, like the whole lot of em’. Voted for the person and party who put more money in my pocket rather than the party that always wants to stick their hands in my pocket. I like my “crumbs”, signed by a “deplorable”. Essentially, Think before you Vote! You are confusing hemp with medical marijuana. cbdoils from hemp is a viable alternative to medical marijuana. cbdoils from hemp you get all the medicinal benefits without the effects of T.H.C. it will help with your various aliments without any side affects. If you would like please contact me as I had massive chronic pain since 2008 and was in 60 pills daily and bed ridden. reply to carolyn….that’s what they are worried about…hemp boone,could spell the loss of money in the other markets—-their markets/stocks and such. Mr Ibach are you working for big pharma or any of the other entities that want to keep hemp illegal or are you representing the American people? The govt. should not take regulate a natural agricultural commodity. The law that put cannabis in schedule 1 was a travesty and we are living with the bad results and loss of our liberty. The biggest burden on the United States Industrial Hemp market is that industrial hemp is still erroneously on the federal Controlled Substances Act. The “fairly narrow regulations” have not helped but hindered our market and the expansion of industry infrastructure. Three years ago I had a German car part manufacturer already making hemp car parts that wanted to invest in a processing and production plant here in Virginia but due to our American farmer and business last regulations in this nation regarding the Hemp industry they have not been able to implement those plans. Currently banking, insurance and investment is sitting on the sidelines of our industry exactly because of these “fairly narrow regulations”. For all the talk about rural development and American manufacturing job creation in the campaign the Trump administration is really disappointing they have not put wind in the industrial hemp movements sails thus far. This current comment by a representative in the administration is extremely troubling. Hemp can help the American farmers bottom line ASAP by giving them another option as the domestic market grows. To build the market we need the Govt to get out of the way with their blatant erroneous restrictive and confusing laws regarding a non drug cash crop that does not come anywhere close of fitting the description of a schedule one controlled substance by its attributes. If we don’t see Industrial Hemp come off the CSA one way or another in 2018 there is going to be very many upset folks added to the list of those already. The American Hemp industry has been extremely patient for the overdue fix to the current restrictive laws but that patients is running out. The United States is the only industrialized nation that does not have a legal Hemp industry but is one of the leading importers of the cash crop and has around 700 million worth of retail sales of Hemp products and rising each year. So the worlds farmers other then American farmers receive the benefit of these “fairly narrow regulations” and the Trump admin thinks more of the same will help the American farmer? This is absolutely terrible policy and grasp of the situation by the Trump admin and it needs to change right away. Hemp will save the world if we start to use it. Over production is very likely problem in the US. Even in Europe, where hemp markets are well established, it´s hard to find a company able to utilize and purchase processed hemp fiber. Now US farmers are growing hemp in comparative area with Europeans, but there´s a complete lack of industry able to further process hemp fiber. This will result to many farmers unable to sell their crop, many startups to fail due to over supply etc. Growing the industry should be prepared with whole value chain involved. Farmers, harvesting contractors, processors and companies manufacturing the final products. If one of these is incapable of doing their part the whole chain will collapse. Worst examples I´ve seen are startups who have compiled their own processing/decortication machinery. They often claim having a capacity of many tons, even 10 tons per hour. And in the video clip demonstrating their machinery they are feeding the processing line usually BY HANDS. This means that their real capacity is few hundred of kilos per hour max. These lines are not able to run profitably in industrial scale. There´s a reason why real industrial scale equipment costs anywhere between 2.5 and 10 million dollars. There´s always something fundamentally wrong with these new decortication lines. You make good points Mikko. Over production of hemp crashing the commodity market is a very real concern like what happened in Canada years ago but using that concern and reasoning to keep the American hemp industry from going to a full commercial phase and allowing banking, insurance and commercial investments to the processing infrastructure to get established with the industry I believe is extremely flawed logic. We need to hear more from the Sec of Agriculture Sonny Perdue on this topic to get the full picture of the Trump administrations plans on the American hemp industry. Do you think Bruce Perlowin’s company, HEMP, inc. have the right kind of decortication machines? It’s amazing how uniformed people really are. What ever happened to principles of economics of supply and demand? Free to grow lavender, mint, watermelons etc. without restrictions but not hemp. Do not understand free markets anymore! The market is there. From new super capacitor applications, to solar panels, to plastics, to a million other uses already known. This administration isn’t concerned about overproduction of hemp. They are concerned about what will happen to all of their friends in Oil, Pharma, Textile, etc. etc. etc. Industrial hemp is already authorized under §7606 of the 2014 Farm Bill. As long as THC levels remain below .3% there is no legality issue. There should be no legality issue for cannabidiol derived from industrial hemp. The larger problem for this administration is that is they allow industrial hemp full bore then the argument for descheduling medical cannabis becomes exponentially more difficult than it has already become. The problem for the industrial hemp industry isn’t one of production or demand, it’s processing infrastructure. HempLogic and PowerZone Agriculture just announced a 20 state tour with a mobile decordicator and plan to sell 15 of the units outright. The market is there 10x over. This administration, especially AG Sessions, simply don’t want to let this horse escape the barn any more than it already has. The generalization of “hemp” lays no differentiation between industrial and cbd (medical). There needs to be some degree of control, due to cross pollination issues that would hurt the different markets. As for the constant thumb pressure of the DOJ and DEA, they are not the agencies to regulate these crops. Industrial hemp is agricultural and falls under the USDA. The fear mongering and lies must stop. Here’s to hemp revitalizing the world. Hemp can feed the planet. Hemp can clean the air, fight climate change and purify water. Hemp can make paper, saving the trees; replace plastics, saving our seas. Hemp can replace cotton, restore the soil, avoid the toxins, and build a textile industry that can dominate the market with better and more durable products. And, alas, the DEA and other justice officials doubt the need and market for hemp. Neither the DEA nor the USDA is looking to be helpful, remove regulation and grow business (as they promised), help those who derive medicinal value, etc. when it comes to hemp. They are playing politics and pandering to various special interests and voting blocks because they believe it will benefit them in upcoming elections. Other administrations have done this too (yep, both parties) but this one seems particularly hypocritical and divisive. Push your legislators on it and then vote based on the responses you get. How can our federal government continue to prop up the notion that hemp needs continued restriction after four years of pilot programs with increasing acreage year over year and more than doubling between 2016 and 2017? I’d also like to draw attention to the fact that global entities like the World Health Organization and World Anti-Doping Agency have published statements that conclude CBD, a compound found in hemp, is not a danger, non-addictive and may have health benefits. The public needs to share this information with their elected officials. ??Mr. Ibach’s comment, “Opening the door wide open nationwide, with no restrictions, may not be in the best interests of the hemp industry” undermines the free market and stakeholders whom already legitimize our domestic hemp industries. I wish we felt more compelled to believe that the government knows what’s best for the hemp industries especially after four years of documented progress. As an industry representative, I have worked with government leaders in legislative and regulatory services at the state level, and I want to work with them at the federal level. We want to address what the industries concerns are, but a lack of restrictions is not one. In some regards, the restrictions which treat hemp as a controlled substance make professional services like insurance, banking, and merchant services decline meaningful business relationships with our industries due to risk mitigation. Right now, the hemp industries would be protected and benefited from a direct exemption for all parts of the plant variety hemp including its compounds, resins and so on from the definition of “marihuana” in the CSA. The “Legitimacy of Industrial Hemp Research” amendment has demonstrated that cultivation in the U.S. is not only viable, but it’s profitable. After four years, it’s time for Congress to protect the progress made with next steps. Thankfully, many key members of Congress are already engaged, listening, strategizing and ready to stand up for the hemp industries. We have faith in our lawmakers and kindly suggest that the administrative bureaucrats quit wasting time dismissing the viability of our hemp industries and instead work with us to understand what our growing pains are. Hemp crops can do it, especially now that the decorticator is back! The machine frees up so much valuable plant pulp as it separates all those precious cannabis fibers. Hemp alone can reinvigorate America’s paper, cardboard, container and clothing industries like we have not seen in ages. We now know the HempHub decorticator tour is on the way, as reported on Feb. 1 by Ms. Kristen Nichols (“Mobile processor promises new fiber opportunities for hemp farmers”). Nice idea! Yet the whole cannabis industry—manufacturing, medicine, nutrition and, YES, adult recreation—is making itself great again, regardless of what our corrupted leaders in Washington, D.C. say or do. Yet we plan on importing another $600,000,000 in hemp from China again this year. Don’t forget Manitoba hemp hearts from Canada as well. Sounds like the American government really doesn’t want the American farmer to succeed. SAD. Guns for school teachers instead of gun control . Insults to leaders of threatening countries instead of peace talks and now to fight the opiate problem to help millions of men women and children afflicted with epilepsey, cancer, and inflammation this corrupt, big money controlled administration proposes restricting agricultural production of a crop grown around the world and declared legal by the congress in the Farm Bill 2014. Citizens unite and throw these self serving, dim witted swamp politicians OUT! Ha , did mj farmers wait for the government to play ball ???? No , they just did the damn thing . Revolutionary actions and unlawful practices can render great results. Hempsters need to get off the sidelines and jump in the game already !!!! Just grow it !!!!! But Rick, how about the children, who will protect the children from this terrible plant. What if one of our youngsters wanders into a hemp field and gets hemp fibers rapped around their necks. We could have a case of accidental hemp death! We need to have Trump protect the children from this deadly devil plant. Oh, the horror of it all! I so agree with you I see this as a divergent, lets. not fall for this. We have come so far. The DOJ is involved due to the question of hemp containing a controlled substance. The 0.3% is great, until some plants undergo reversion–sure you don’t know what that is. Other probs are plant concentrations–and perhaps the biggest the plant is a Phytoremediator in situ–go look it up and learn. As to the USDA–sans these problems the biggest question is –does the crop make money–IN THE USA. It does not. The $680,000,000 of imports come from countries with low land costs and average wages ubnder $2.00 and hour –China is $0.50/hr. You cannot grow-make “Corn Money” transport, process and produce BAST fiber for twice what the import cost is. But please don’t let the facts get in the way of your earnest outrage. LOL! We won’t let your highfalutin haughtiness get in our way, either. The wealth from hemp crops was obviously stolen from farmers and the whole country starting in 1937—right before the first “decorticating” machine hit the market. This is America, Gail, the “land of opportunity,” yet for an 81-year period it has been run by ruthless federal bureaucrats and lawmakers hellbent on denying all Americans—not solely farmers—the infinite economic opportunities supplied by cannabis raw materials (seeds, fibers, pulp and seedless flowers). How about you look up that travesty and learn why. In 2018, our domestic cannabis markets would be HUGE if these complete tyrants were not still abusing federal power and imposing this “marihuana” fraud. You should be outraged, too. The point of having the crop grown in America is for American jobs. And quite frankly? I trust anything grown or made in the good ole USA over China anyday!! The DOJ can stick its nose where it belongs – administering the laws as they have been written. That’s their job. That’s it- look it up. People first , government fear us and dare not stand in our way . You belong to us we do not belong to you. Who asked for your help? The Americans in the industry you claim to help ? Our government agencies need be fighting over who gets to be the one who repairs the damage of the original sin. When shall we stop with one more law and begin admitting our mistakes and remove them. Can we not manage the same pressure as placed on the Pope to apologize and cut it out . If any management company came to my biz with the same track record as our government I would laugh them out the door. Are these not the same smart guys who all but crushed our country a few short years ago. We do not need you. Do not be fooled by the fancy talk. It aint that hard to run a biz proper like . I wonder how often they KISS anybody up there. Anything anywhere that says anything about hemp or cannabis being a controlled substance should just be dropped. It is only common sense. The world is no longer flat . The fed says 47% of Americans can not come up with $400 for an emergency. Let us redirect these numbskulls to a worthy cause. This is the true battle at hand. A war effort is warranted. We must stop pretending we have a choice. Starbucks broke down the trade barrier with China for coffee, notice more $3.99Lb bags of coffee at the grocery? As long as Trump is promoting the Chinese over Americans we won’t have freedom to grow hemp here. Don’t fall for the Free-Trade, helping the poor farmers of third world countries, they aren’t much different than the USA, we just have shinier strip malls blocking the view of oppression and piles of trash. Our farmers are just as poor here, why do you think they sell out to Monsanto?